Just 20 metres from Park Beach, Hawaiian Sands features an outdoor swimming pool, a sunny terrace and a barbecue area with outdoor seating. Free Wi-Fi and a flat-screen TV are standard in all rooms. 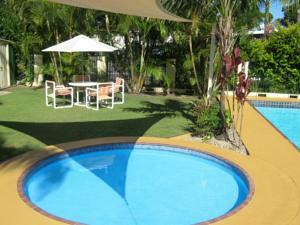 Hawaiian Sands Motor Inn is 5 minutes’ drive from central Coffs Harbour and The Big Banana. Coffs Harbour Airport is a 10-minute drive away. All rooms are air-conditioned and have a microwave, refrigerator and tea/coffee making facilities. Each room has a spacious seating area and a work desk. Guests can relax in the garden, or enjoy a meal in the barbecue area. Free parking is available on site. Free! All children under 2 years stay free of charge when using existing beds. One child under 2 years is charged AUD 10 per person per night in a baby beds. One older child or adult is charged AUD 10 per person per night in an extra bed. All older children or adults are charged AUD 10 per person per night when using existing beds. The maximum number of extra beds/baby beds in a room is 1. Any type of extra bed or crib is upon request and needs to be confirmed by management. Supplements are not calculated automatically in the total costs and will have to be paid for separately when checking out.